Description: Rhizome short-creeping, thick, covered with pale, papery scales. 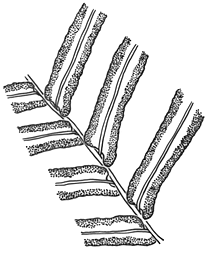 Fronds mostly 30–80 cm long, erect, 1-pinnate, mid to dark green; stipe brown at the base, densely covered with pale scales and hairs; pinnae ± opposite, stalked, ± glabrous, in 15–30 pairs, with a terminal pinna, decreasing in size towards base of frond, upper pinnae 10–15 cm long and 1 cm wide, the lowermost pinnae 2–5 cm long; veins free, simple or forked once. Distribution and occurrence: Grows on hillsides, often near streams; rare. Favouring Limestone. In Sydney suburbs often volunteering on and around concrete structures, such as crib walling and mortar joints in old buildings and railway platforms. Other Australian states: Qld Vic. W.A. ?N.T.